An actress known for her role in the Harry Potter films joined experts and campaigners on a Welsh river as part of a study into plastic waste. Bonnie Wright, who played Ginny Weasley, is working with Greenpeace UK and academics examining the level of micro plastics in British waterways. 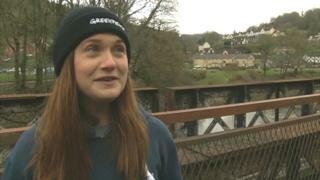 Samples taken on the River Wye in Monmouthshire found tiny pieces of plastics, she said. "I think it is incredibly worrying," she added. "Every time I have done the trawling for plastics, like we have done today, there's not been one time the net hasn't come up with some type of micro plastics. "So it just shows that in this tiny section of a river, there is plastic." Samples taken on the River Conwy in Conwy county also produced micro plastics, according to Fiona Nicholls, Greenpeace UK's plastics campaigner. "That was really surprising," she said, given its rural location. "There needs to be strong legislation that protects our environment." The Welsh Government said it was continuing to work to reduce the use of every day plastics and how it is disposed. And a bill to protect the environment was announced by the prime minister last July. On Tuesday, Wright helped to take water samples from three different points along the Wye using a filtering device called a manta net. They will be sent to the University of Exeter for further analysis and compared with samples from other rivers across the UK for a report. University ecology lecturer Kirsten Thompson said: "There are a lot of studies showing how much plastic is in our seas and oceans, but very few so far investigating the amounts and types of plastics, especially micro plastics, carried along by our rivers. "We hope that our research on rivers in England, Scotland, Wales and Northern Ireland will help uncover exactly where this plastic is coming from and what impact plastic pollution may be having closer to home on creatures like otters, kingfishers and water voles."